Woodside Health Centre is a new NHS healthcare facility in Glasgow for which we created a series of design interventions. The building comprises of three parts: the health centre, the addiction services and the elderly day care centre. Each of the above required separate and distinctive entrances. We worked alongside Hub West Scotland, Morgan Sindall and Page\Park Architects as well as local community groups. Woodside Health Centre is at the heart of a multi cultural community, therefore our main aim when designing the integrated artwork was to find design solutions which would include and consider the variety of local people using the facility. We engaged with local communities to inform our design process, including the thoughts and aspirations of the people who will be using the centre. Following the engagement sessions, the themes which emerged were past and present architecture from the local area, flora and fauna from the nearby canal, the multi cultural backgrounds of residents and the history of the area. Concrete patterns on the facade of each entrance leads visitors into a patterned interior design scheme. 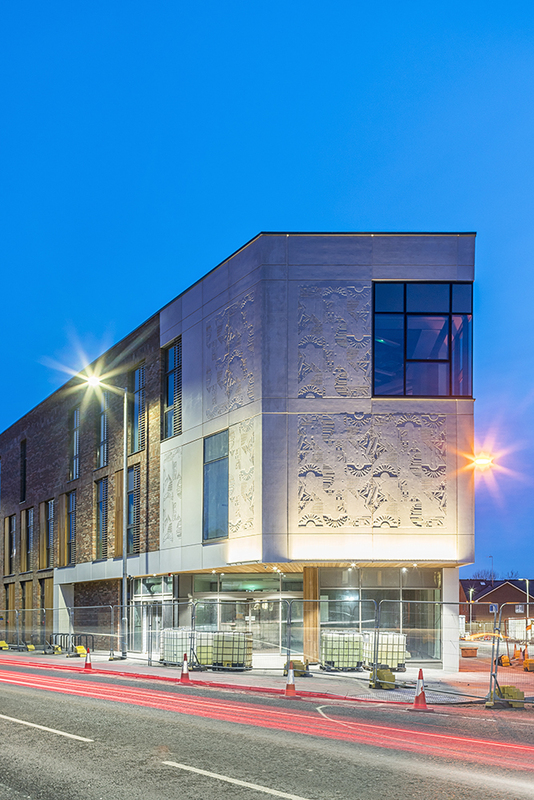 The illustrative designs are imprinted in pre-cast concrete panels and are integrated into a geometric tile formation tailored to the fabrication process. Illustrations are inspired by the products of the ancient industries from the local area, the fauna and flora from the nearby Forth and Clyde Canal and local architecture such as the Mackintosh Church and the lost Art Deco cinema. These are combined with a geometric "key pattern” which provides cohesion whilst ensuring that each entrance is distinctive which will assist in way finding around the centre. The patterns are carried through the interiors of the building where the themes such as plants and flowers found around the canal area and the local architecture are engraved onto timber slatted partitions. One side of the slats is botanical to soothe visitors on arrival whilst the other side is architectural to ease their return to the outdoor urban environment. This double sided aspect of the artwork provides playfulness and distraction. The original design scheme also shows patterned wallcoverings within the ground floor alcove areas, a vinyl manifestation on the canopy of the atrium using a colour scheme inspired by the multicultural communities. Backlit fiberglass panels were created for the lobby area to act as a window into the various cultures of the people who will visit the centre. Plants and flowers from areas of Europe, Africa and Asia coexist in a dynamic jungle pattern to provide greenery within the large white spaces. Colourful geometric shapes inspired by the key pattern from the outside entrances are inserted within the foliage. Our inspiration for the project stemmed from a series of workshops with groups of people from a wide variety of cultural backgrounds from China, Pakistan to India. 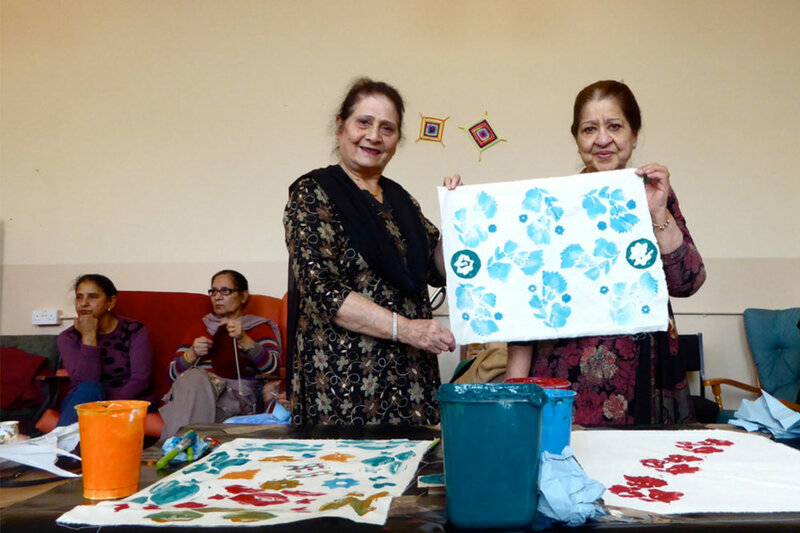 We worked with the local residents creating patterns utilising traditional textile printing methods from different cultures.